Ask Dave Mathewson about his four-year-old El Cajon-based business, Mathewson Electric, and he describes a venture born of necessity but in truth sired by his father’s example of a solid work ethic. In 2008, Mathewson was employed in a union job as superintendent for a high-end remodeling company, also running the company electric shop. Then, in 2009, the economy tanked, the firm folded, and Mathewson was out of work. Mathewson is dedicated to doing business the “old-school” way his Dad taught him, to deal fairly, say what he means, and mean what he says. ”We’re there to please the customer,” Mathewson said. And now, Mathewson’s enterprise expanded so much he hired his brother, Dan, as an office employee taking phone calls and scheduling appointments. Mathewson’s background was in electrical work for construction and remodeling, with experience in projects to conform to Title 24 California code requirements for energy-efficient components. This had convinced him that electricity’s future as a power source lies in diminishing individual consumers’ energy needs. Mathewson’s initial plan was partnering residential electrical remodeling with a foray into solar energy. But his family’s fondness for cars led him instead to choose as his sustainable energy focus the installation of chargers for electric vehicles. In mid-2011, Mathewson landed his first such account, the exclusive contract for charger installations for the fully electric Fisker Karma Roadster. His first residential installation, at the “biggest house I’ve ever worked at,” was for Gateway computer mogul Ted Waitt. (Other popular current EV models include the Nissan Leaf, Chevy Volt, Ford Max, Toyota RAV4 Electric, and Fiat 500e.) Today Mathewson averages two residential EV charger installations every week. Rebates from the state of California, San Diego Gas & Electric, and single-driver access to high-occupancy-vehicle lanes support the emerging EV market. 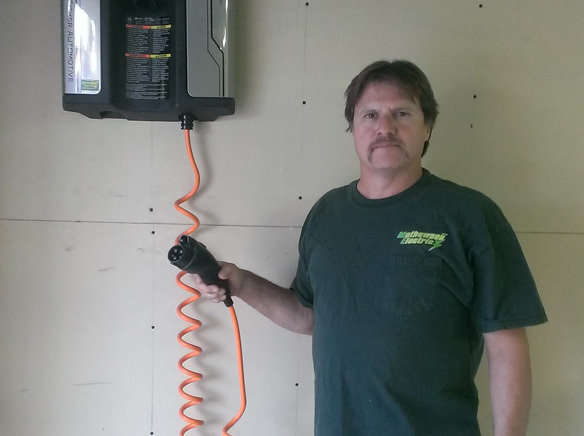 Mathewson envisions an energy efficient future for his children, believing, “An electric vehicle will be in every garage by 2020.” The 110-outlet trickle charger provided with every EV sold takes 8-12 hours for full charging. Level 2 chargers halve that time to 3-4 hours. While acknowledging that roadside refueling infrastructure to support widespread use of EV’s is “not there yet,” his assessment is that the 75-80 mile charge now possible with lithium batteries will eventually reach the threshold 100-mile-per-charge level estimated to break even with capabilities of internal combustion engine-fueled cars, as market success drives down EV battery prices. He notes that EV’s will outlast gasoline-fueled vehicles and by contrast require common maintenance only for tires. Mathewson has installed five different types of EV chargers, with installation taking about 2 1/2 hours, and in the quest for a universal charger he praises the promise of Aerovironment’s model, which he describes as sturdy, waterproof, user-friendly, and suitable for indoor or outdoor charger stations. The Mathewson Electric company’s paired slogans are “Ready to Wire! and Ready to Charge!” for the 60 percent of remodeling and 40 percent EV charger installations that compose their client bases. Mathewson Electric is licensed, bonded, and insured.